Venerable Canadian sketch-comedy show Royal Canadian Air Farce will celebrate its 300th episode Friday night with an hour-long, live-to-air show. The evening could be "a disaster in the making," Roger Abbott told CBC News Friday morning, just before the first of several scheduled rehearsals of the landmark episode. "That's part of the attraction, part of the fun of doing it." 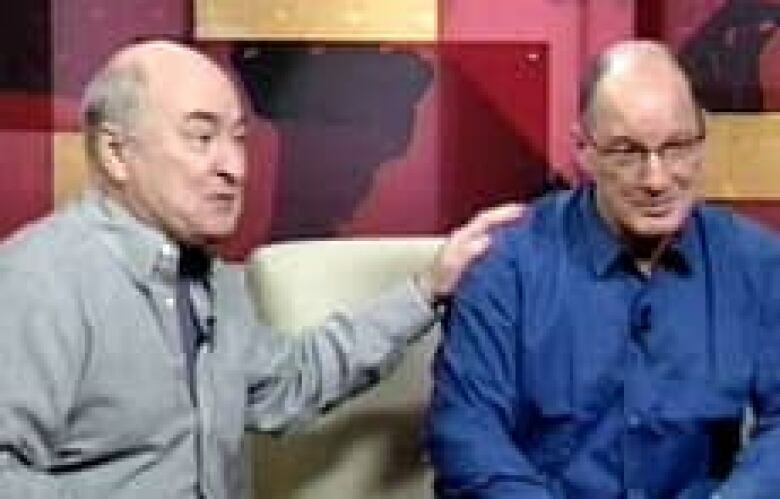 The long-running program originated on CBC Radio in 1973.A firstattempt to introduce the show to television audiences came in 1980, followed by a 10-episode seriesand several once-a-year TV specials over the next few years. 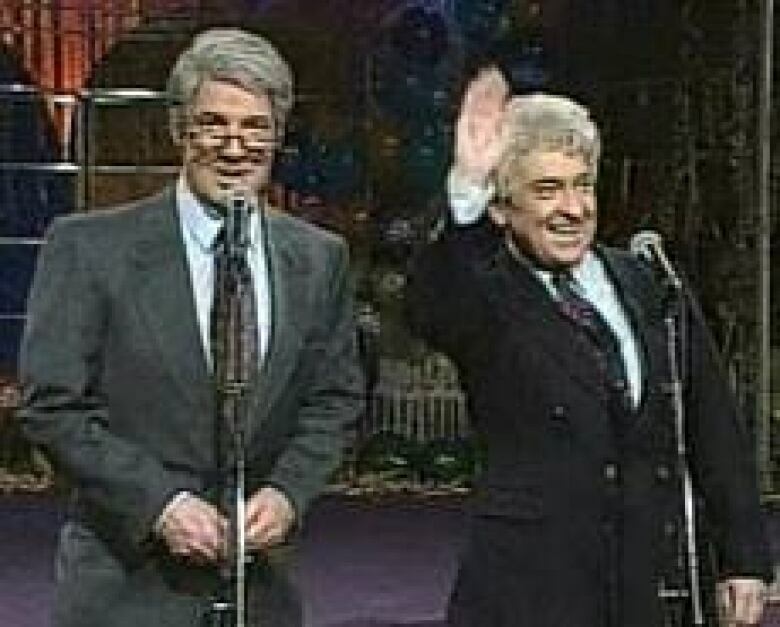 After a 1992 New Year's Eve special made a big splash with viewers, Air Farce was adapted to be a mainstay of CBC-TV, with a new series officially debutingin October 1993. While the show is normally recorded in front of a live audience, "we've never done Air Farce live to air," Abbott said Friday morning. "This is going live to the six Eastern provinces: Newfoundland, the three Atlantic provinces, Quebec and Ontario. The instant we finish at nine o'clock Ontario time, it starts in Manitoba. There's no time to fix anything," he said. For the live episode, Air Farce 's regular cast of Abbott, Don Ferguson, Luba Goy, Jessica Holmes, Craig Lauzon and Alan Park will be joined by special guest stars, including Penelope Corrin, who stepped in during Holmes' recent maternity leave. Among the sketches set for Friday night's show, there will be a mash-up of two current Canadian sitcom rivals featuring Little Mosque on the Prairie's Sitara Hewitt, Sheila McCarthy and Carlo Rotaas well as Corner Gas's Fred Ewanuick. Comedian and actress Mary Walsh, who created CBC-TV's This Hour Has 22 Minutes and Hatching, Matching and Dispatching, will also drop in for a sketch featuring her warrior woman character Princess Marg. Friday's program will also continue with Air Farce's tradition of topical political and social satire, with sketches poking fun at Prince Harry, Conrad Black and Barbara Amiel, as well as Prime Minister Stephen Harperandfederal Liberal Leader Stéphane Dion. According to Abbott, Air Farce will keep going "as long as crazy things are happening in the world or socially. Or as long as Ottawa is still standing." "Supplying us with raw material, God bless them," Ferguson added. The 300th episode of CBC-TV's Royal Canadian Air Farce will air live from Ontario through points east, beginning 8 p.m. ET and 9 p.m. AT (9:30 in Newfoundland). The rest of Canada will see the program at its regular Friday evening slot of 8 p.m. local time.